Well folks, I’ve got a bit of a bittersweet announcement – Jesse and I are headed back to the U.S.!! On one hand, I can’t help but be excited to get back to the ease and comforts of home. On the other hand, we really feel like China welcomed us with open arms and I’m a bit sad to leave it. It’s definitely a strange a feeling. In a large bowl, cream together butter, granulated sugar, and brown sugar until light and fluffy, about 2 minutes. Add the food coloring until you reach the desired color. Add the egg and vanilla and mix until combined. Add the flour, baking soda, salt, and cocoa powder, mixing until thoroughly combined. Use a rubber spatula to gently fold in the white chocolate chips. Using a cookie scoop, place the dough two inches apart on the baking sheet. Gently flatten with the bottom of a measuring cup. Bake for 10-12 minutes or until slightly crispy around the edges. Thanks! I feel like my cookies here in China have been extra fluffy… The eggs here are like super eggs, I think!! I need to make these cookies again when I get home to see if there is a difference. Ref Velvet anything is good1 Can’t wait to try these. I just wanted to wish you luck on your big move- all this time I thought you were in California (it said Sunny Side Up in San Diego on the blog roundup list for the shower)) and lo and behold you’re actually in China! I’m sure it’s a particularly stressful time for you right now, so I wanted to let you know I was thinking of you- I hope you have a safe journey back, an easy transition, and that your new home is filled with lots of love and happiness. I’m sure once you step inside the kitchen again, you’ll feel much more settled in your surroundings. I know that’s the place I feel most at home! I’m anxiously awaiting your return to cooking/baking and blogging, so I can see more of your fun, inventive, delicious creations. 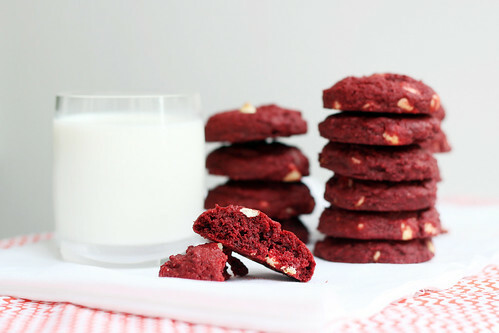 (Those red velvet cookies look divine, by the way! 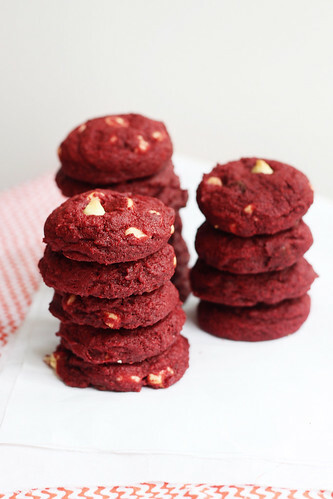 The white chocolate chips remind me of the traditional swirl of cream cheese frosting that usually adorns a red velvet cupcake.) Looking forward to talking to you again soon! Just made these. Had a ton of poor recipe results on the interwebz, and these are beautiful, and soft, and FANTASTIC. Thank you so much! BTW, these don’t drop really in the oven, so PERFECT for cookie cutters! Ours were stars. I made these today! Great recipe! Thank you!